Pear Tree Greetings wins LOUIE Award! 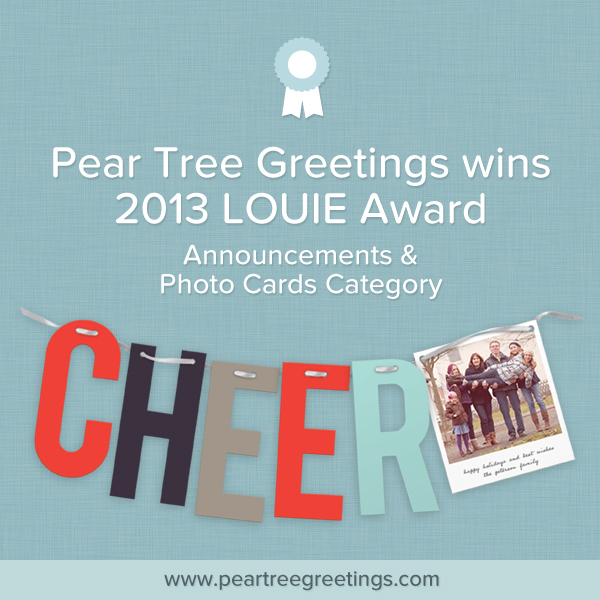 As the General Manager for Pear Tree Greetings, I am thrilled to share the news that Pear Tree Greetings has won a 2013 LOUIE Award for our Modern Cheer Photo Christmas Card! A LOUIE Award is to the greeting card world what the Oscars are to the movies. It’s a huge honor. All of us at Pear Tree are especially proud of our tiny, four-person design team who went up against some of the giants of the industry to take first place in the Announcements & Photo Cards category. I’ve never seen a team work so hard to bring forward the very best in paper engineering, with our unique shapes and modern designs. Our customers inspire our creativity and passion every day and it shows in our products. Join me in sending a huge congratulations to this amazing team. Please vote for Pear Tree by clicking here and liking the Cheer design. We’d love to hear your comments, too! Thanks for being our inspiration and our support. We look forward to showing you more award winning designs in the future!